Infrared thermometers are used to measure a surface temperature, the user aimsthe IR Thermometer at the target, presses a button, and reads the temperaturedisplay. The device has an optical lens that collects the radiated infraredenergy from the object and focuses it on the detector. The detector convertsthe energy into an electrical signal that feets amplified and displayed as atemperature reading. An infrared thermometer measures temperature by sensingthe magnitude of radiated energy at infrared frequencies. 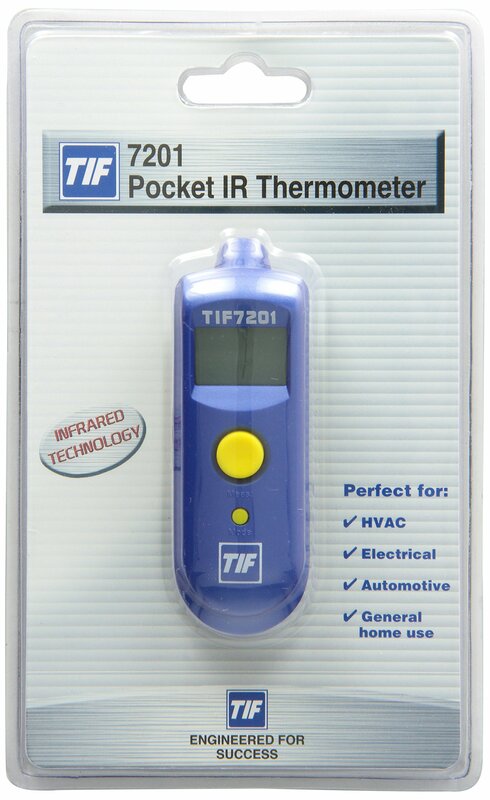 Using this data andthe actual temperature of the detector, the thermometer calculates thetemperature of the surface that emitted the energy.This product features SoC(System-on-a-Chip) Technology. Complete IR design incorporated on a singlechip, creating compact and lightweight design. Innovative optical lens withhigh accuracy measurements over a wide temperature ranges with a 1:1 distanceto spot ratio. Simply point at desired target and press the trigger fortemperature reading. Visual low battery indicators and requires two inchAAAinch batteries which are included.